RD1U, what does that mean? 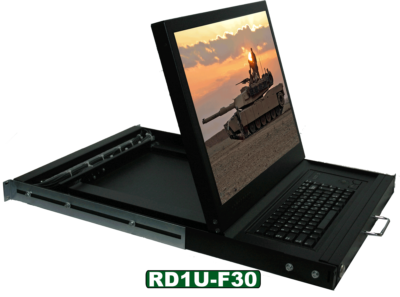 RD1U is short for “Rack Drawer 1U”. It is a drawer designed to fit in a 19″ wide rack. 1U is 1 Rack unit or 1.75″ per unit in hight. 2U, 3U, 4U is 2×1.75″, 3×1.75″, or 4×1.75″ etc. 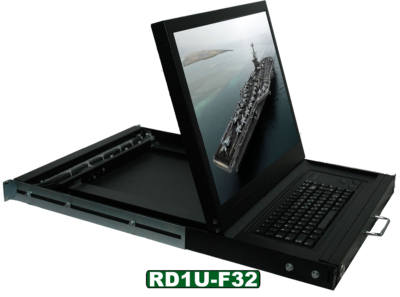 RD1U-F is our F Class or LAY FLAT design of rack drawers. The panel lays back flat in the drawer in the stowed position, until you want to use it. Then you pull the drawer out and pop it up and return the drawer to the deployed position. The keyboard is positioned in front of the LCD and they take very little space when the unit is deployed, we code name them stealth keyboards. We can also use large trackballs in this type of unit because of the position of the keyboard. Some units have built in KVM switches which we put un the back portion of the rack drawer otherwise the cables come out a cable pass through port in the back. The series dictates the depth of this drawers. 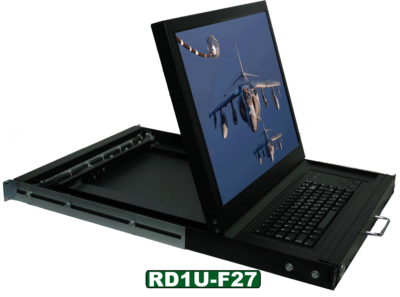 The F27 series lay flat are 27″ in depth, and have no room to integrate a KVM switch. Our F30 and F32 are 30″ and 32″ in depth respectively. Each one can have integrated KVM and the depth is determined by which KVM switch you chose.